The best car ramps for small and medium sized cars have a moderate incline specifically to address the low ground to frame clearance of sports cars and sedans. Those with trucks or SUVs may get by with using ramps with a sharper incline but what’s the point when the more gradual incline ramps accommodate pretty much any vehicle. All good vehicle ramps should be lightweight and designed for easy storage. Ramps and jacks can be dangerous, and some care should always be taken, such as always using more than one support device. Always use a pair of wheel chocks to block the ground tires to prevent accidental rolling. In addition, using a pair of jack stands offers extra insurance. Vehicle ramps are designed for use on relatively level ground, and are more dangerous when used on any incline of more than about 5 degrees. While good quality car ramps are built to be as safe as possible, a little responsible usage goes a long way towards added safety. Note: Wheel chocks should ALWAYS be used along with ramps. 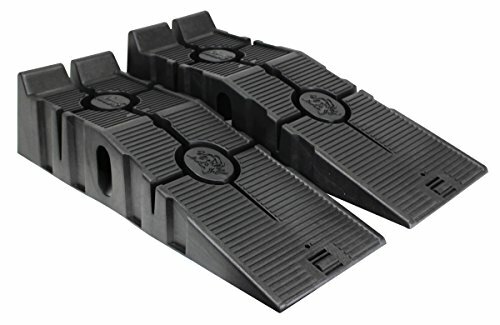 The popular RhinoGear 11909 ramps are designed with a low profile to accommodate small cars, sports cars, and larger vehicles up to trucks and SUVs. These ramps give you an additional 6 ½ inches of clearance making it easy to fit an oil drain pain underneath for oil changes, and the 22 inch ramp length is perfect for cars that have very little clearance. The pair of ramps weigh a total of about 16 pounds and have a stackable design that allows you to store them in half the space. The patented polymer support systems is designed to handle loads of up to 6 tons, which is more than sufficient for all but the largest of personal vehicles. Each ramp is extra wide, as well, allowing you to use them for tires as wide as 9 inches. Even though this set of ramps is described as having a non-skid base, you may want to invest in a couple of inexpensive floor mats to put down under them. Using mats gives the ramps more friction, while the weight of the vehicle prevent the ramps from moving around on top of the mats. Also, because of the tendency of the ramps to slide a bit over the smoothest of surfaces, it would have been better if the end stops were a bit taller as an extra safety precaution if the driver overcompensates by pushing the gas pedal a bit more. The only other complaint of any importance pertains to how quickly they will break down in direct UV light. This can be easily avoided, and storing them in your shop or garage will give you years of use. 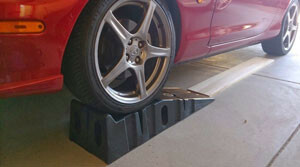 RR-40 vehicle ramps will give you a little more clearance, lifting your vehicle a full 7 inches. They are designed to be lightweight and non-skid (even on slick surfaces), and the pairs weighs in at less than 9 pounds. These ramps are a bit costly but do not have either of the small negatives as the RhinoRamps and sports care enthusiasts rave about them. The normal 40 inch version of these ramps is perfect for most vehicles but longer 56″ (and even 67″) versions are also available for extra low profile vehicles. 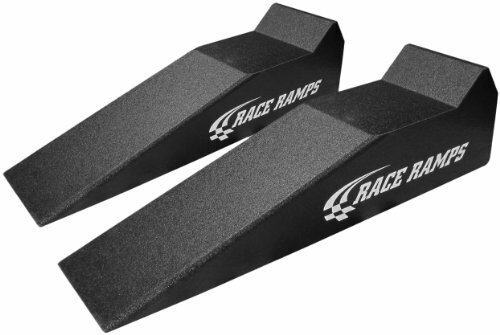 Race Ramps will work great for Vettes, Mustangs, Porsches, Cadillacs, Miatas, Honda Odyssey minivans, and even full size pickups. Really, anything up to an 8″ wide tire and up to 6,000 pounds. Race ramps combined with a good mechanics creeper will allow you to change your oil in record time. The only negative is that these ramps are not designed to nest, so you will have to allocate some extra space for storing them. The good thing is that they are so light, they can be kept almost anywhere. Will the Rhinoramps work for a Miata? Unlikely. You’re going to need something with more of a gradual incline due to your low profile. The Race Ramps are your best bet. They come in different lengths so even ultra low profile cars can get on them without scraping. Huge fan of race ramps. Theyre the only ramps I got to fit under my C6 Z06.